I was jogging on the beach this morning. I say that with a certain air of nonchalance, but there’s nothing casual about it. Taking up running is a major leap for someone who only ever runs in short bursts – like when there’s a basketball to chase or an opponent to beat. Or when I’m about to be hit by a bus. Just two hundred metres into it and the voices in my head are almost hysterical. What’s the point? You (snigger, snigger), a runner? You’re so slow. EB is already halfway up the beach. You may as well be standing still. Seriously, isn’t it a bit late in life to start doing this? Just walk. Walking is so much more civilized. And it’s such a lovely morning. 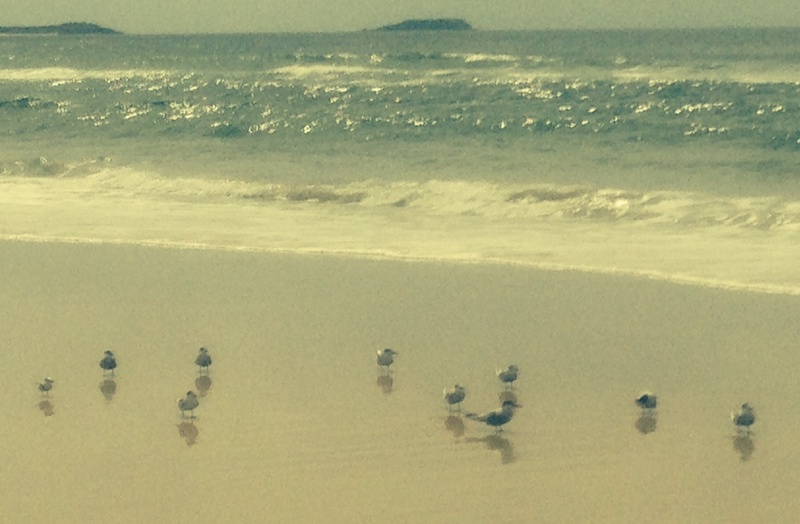 Look at those birds… so relaxed. Running. Pfft. But I just keep chanting to the beat of my bare feet: If not now, when? If not now…when? Which got me thinking about a man I met at my daughter’s work last week. I’ll call him Joe. Joe retired two weeks ago – but it wasn’t planned or voluntary. Almost two decades with the company is a long time to end with a hasty farewell. He said he woke up the next morning and was shocked to find that someone had finished off two of his bottles of pinot. Then he realized it was him. Somewhere between the hangover and the day I met him, he’d gone from feeling rudderless to mapping out back-to-back self-guided walks through Italy. He leaves in July. Joe is like most of us – it usually takes a nudge, or a mighty shove, to get us living the life we’ve imagined. Many of us leave it too late. Because those relentless naysayers in our heads tell us there’s much to be done and no time for acts of self-indulgence. “The pathway is smooth. Why do you throw rocks before you?” says the old Chinese proverb. The answer is fear. Fear of letting go, fear of taking a chance. What if you don’t like travelling indefinitely? What if you lose everything you’ve built up over the years? What if you end up broke and miserable? What if. We throw excuses and perfectly valid reasons before us. And those ‘rocks’ become huge roadblocks. As a writer (and potential, um, multi-lingual runner), I know all about those roadblocks – the fear of failure, the resistance to even begin. 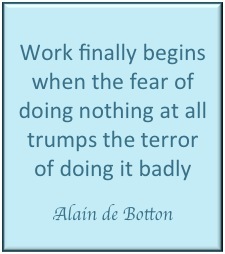 That’s why I have Alain de Botton’s wise words (left) stuck to my computer. The beauty of getting older is that you finally acknowledge (well, you can’t avoid the fact) life isn’t forever – you won’t always have your health, your fitness or even your mind. And you realise your biggest fear – way bigger than the fear of failing – is never having given your dreams a fighting chance. Back at the beach, I’ve pounded out my very first kilometre – then another few hundred metres (after some breathless staggering and a nudge from EB who’s ‘caught up’ to me… on his way back). Small steps, the pesky voices remind me. Must you mention this insignificant moment… on a public forum? But they’re oddly subdued now. Ah. What roadblocks have you set up? Are they so high you can’t even see, anymore, where the path goes or if there are other paths you’d like to explore? Be inspired by Joe and by all the people who look fear in the face and do it anyway. Because I reckon today is as good a day as any to begin pulling down those roadblocks, even if it’s one pebble at a time, and start chasing down those dreams. This entry was posted on Monday, March 31st, 2014 at 8:40 pm	and tagged with aspirations, dreams, fear, fear of failing, jogging, Kingscliff, Over-50s, Resolutions, retirement, roadblocks, running, travel and posted in Australia, Travel, Uncategorized, Wellbeing. You can follow any responses to this entry through the RSS 2.0 feed. Louise, thanks for the words. As we both face the latter years of life, I wanted to share with you, I am only eight weeks away from publishing my first book. Sooooo excited… and you have added [without knowing] just a little bit of belief in the tank for me to finish the project. That’s awesome aussiewombat! Glad my post helped your momentum 🙂 I think we all hugely underestimate our abilities (especially us writers!). Congrats on your pending publication and keep believing!